(see our other article on personal assistant gardening tractor). And with spring comes the chore list that grows ever longer for those homestead honey-doos. Making redwood chip spreading a breeze. 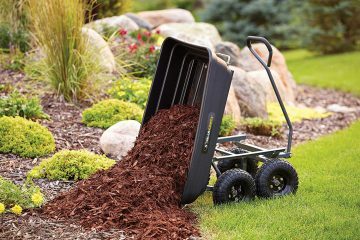 First on the list is spreading fresh redwood chips and mulch all around the flower beds, garden areas and trees. 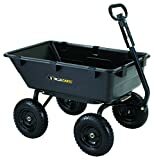 For this job we looked to the Gorilla Poly Garden Dump Cart with a 600 pound (gasp) weight capacity. Now let’s be honest, I didn’t test that 600 pound number and I’m sure in some test lab, they were able to achieve it, but suffice to say I had a good 100+ pounds of chips/mulch in the bucket and it handled itself pretty well. The bucket held quite a bit of cargo and the 10-inch pneumatic wheels (filled with air) held its ground and maneuvered pretty well throughout the grass, pebble trails, driveway and chips. We got sideways in the mud a bit but more careful gardeners wouldn’t push the Gorilla to its limits as our overzealous test team. We liked the extra long handle with foam grip as we didn’t have to bend down to pull. And the quick release dump feature worked really well for this job. Tires have good tread and the bucket seemed heavy-duty enough for the chores on our list. First honey-do is done, thanks to our Gorilla dump cart. For the price, I’d say it’s a no brainer for the ranch, cabin, homestead and anywhere else you need a real workhorse. Maintain your Gorilla well and he will be your garden beast for many years to come; don’t leave him out all winter in the cold and be sure hose it off and dry thoroughly occasionally. A good spray of light lubricant like WD-40 around the axles, bearings and wheels will keep the rust at bay – for a while anyway. Here’s a few other recommendations below as well. Happy gardening and let us know your thoughts!